Successfully Added Rear View Mirror Car DVR - 1080P Recording, 140 Degree lens, 4.3 Inch LCD Display, Rearview Camera, G-Sensor, Auto Recording to your Shopping Cart. 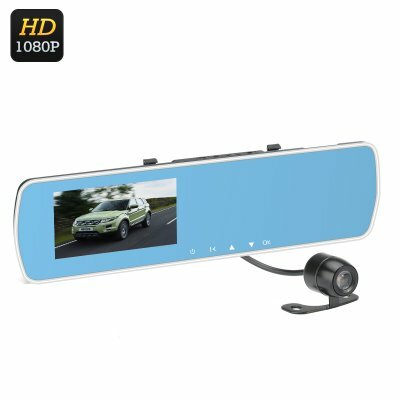 This rearview mirror DVR has a HD built in camera with a 140 degree wide angle lens that can record 1080p images at 30FPS. It includes a 4.3 inch LCD screen built into the rearview mirror which will display the footage at 720p, although your recorded footage will remain at 1080p. The default setting allows the screen to switch to standby when not required so you won’t be distracted and can use the full review mirror normally while driving, but you can rest assured that the loop recording will be discreetly record all that happens in case you need to document and incidents on the road. This practical DVR has a built in G-sensor that will detect any sudden movement of your motor vehicle and lock the recording at that time to ensure it can't be recorded over in error. With an 8MP color sensor and auto white balance the front facing camera ensures a good image quality no matter the weather conditions. With a rear camera you can not only record what happens in front of the vehicle but also any incidents that happen behind you in the dual recording mode, so if you have to brake suddenly and are hit from behind the DVR will document every detail. You can park with ease thanks to the reverse camera that will automatically be displayed when your enter reverse, This can help cover blind spots and saves you straining your neck to see when parking and maneuvering. Supporting up to 32GB of storage space through the micro SD card slot you can recording plenty of footage and even snap pictures with this car DVR as the 600mAh battery gives you up to 1 hour of usage time. Compatible with most cars and motor vehicles this DVR clips directly to your rear view mirror and can be installed in seconds. The Review Mirror Car DVR System comes with 12 months warranty, brought to you by the leader in electronic devices as well as wholesale car DVRs..